At NIA, we know just how big an impact insulation can make. Looking at energy and financial savings, longer system life, and more efficient operations, there are few other technologies that pack as big a punch as mechanical insulation. 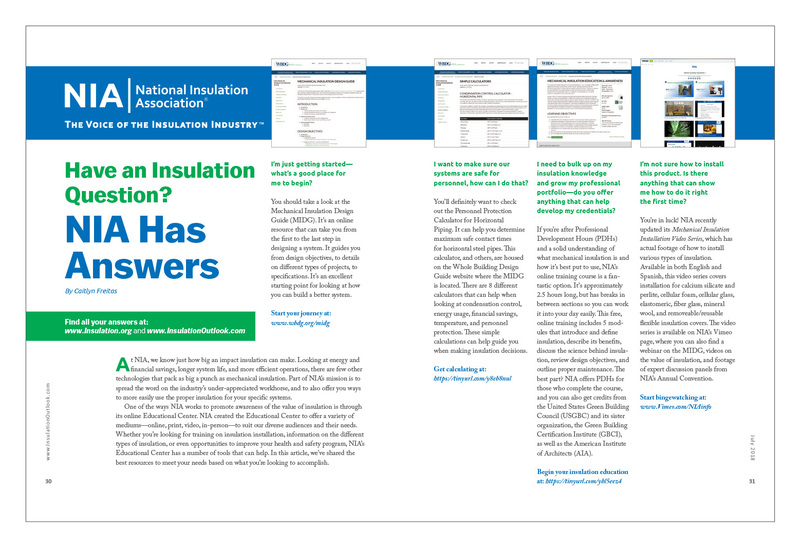 Part of NIA’s mission is to spread the word on the industry’s under-appreciated workhorse, and to also offer you ways to more easily use the proper insulation for your specific systems. One of the ways NIA works to promote awareness of the value of insulation is through its online Educational Center. NIA created the Educational Center to offer a variety of mediums—online, print, video, in-person—to suit our diverse audiences and their needs. Whether you’re looking for training on insulation installation, information on the different types of insulation, or even opportunities to improve your health and safety program, NIA’s Educational Center has a number of tools that can help. In this article, we’ve shared the best resources to meet your needs based on what you’re looking to accomplish. I’m just getting started—what’s a good place for me to begin? You should take a look at the Mechanical Insulation Design Guide (MIDG). It’s an online resource that can take you from the first to the last step in designing a system. It guides you from design objectives, to details on different types of projects, to specifications. It’s an excellent starting point for looking at how you can build a better system. I want to make sure our systems are safe for personnel, how can I do that? protection. These simple calculations can help guide you when making insulation decisions. I need to bulk up on my insulation knowledge and grow my professional portfolio—do you offer anything that can help develop my credentials? If you’re after Professional Development Hours (PDHs) and a solid understanding of what mechanical insulation is and how it’s best put to use, NIA’s online training course is a fantastic option. It’s approximately 2.5 hours long, but has breaks in between sections so you can work it into your day easily. This free, online training includes 5 modules that introduce and define insulation, describe its benefits, discuss the science behind insulation, review design objectives, and outline proper maintenance. The best part? NIA offers PDHs for those who complete the course, and you can also get credits from the United States Green Building Council (USGBC) and its sister organization, the Green Building Certification Institute (GBCI), as well as the American Institute of Architects (AIA). I’m not sure how to install this product. Is there anything that can show me how to do it right the first time? You’re in luck! NIA recently updated its Mechanical Insulation Installation Video Series, which has actual footage of how to install various types of insulation. Available in both English and Spanish, this video series covers installation for calcium silicate and perlite, cellular foam, cellular glass, elastomeric, fiber glass, mineral wool, and removeable/reusable flexible insulation covers. 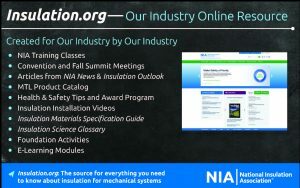 The video series is available on NIA’s Vimeo page, where you can also find a webinar on the MIDG, videos on the value of insulation, and footage of expert discussion panels from NIA’s Annual Convention. What the heck does “absorptance” mean? Have you come across terminology you didn’t fully understand? NIA’s Insulation Science Glossary will break down all the terms you need to know when dealing with insulation, from basic to advanced. The glossary is located on the Specs & Codes page on NIA’s website, where you can also find the Insulation Materials Specification Chart, which lists physical and material properties of various insulation materials as specified in ASTM Materials Specifications; and the Guide to Insulation Product Specifications, which compiles all current ASTM, federal, and military specifications relating to the insulation industry. The web page also lists the various the codes and specs used by the industry—it is a great place to start if you’re looking to get the most up-to-date information on codes. I’m not sure if the insulation on my system has been installed properly—what should I do? This exact industry concern led NIA to develop its Thermal Insulation Inspector Program. After talking with industry members, we found a common issue was that building owners or engineers weren’t able to certify that insulation had been installed properly. In response, we developed the Inspector Program, which will certify individuals to determine whether insulation was installed according to the specification. The program is still being developed, and more information about the first classes will be available soon.